Published in Rafu Shimpo, October 5, 1955. 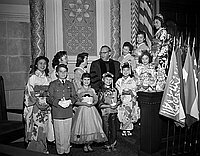 Golden jubilee celebration of the National Council of Jewish Women, Los Angeles section featuring a United Nations processional with Nisei Week queen Stella Nakadate and her court and children representing various nations at Sinai Temple in Los Angeles, California, October 4, 1955. 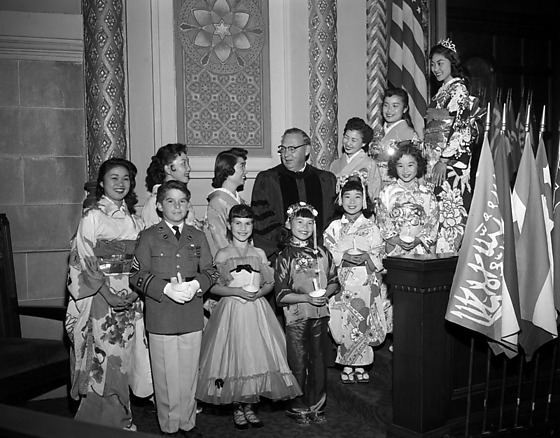 Includes children and Nisei Week court standing around Dr. William Lindsey Young, vice-president of the National Conference of Christian and Jews, at the side of stage; and a group of men and women in formal attire stand behind children and young women in ethnic costume, including kimono, Scottish kilts, Chinese cheong sum, United States Army uniform and others. The court is identified (neg 1): Margaret Fukuda, Hazel Fujikawa, Margaret Ouchi, Aki Mitani, Nori Shizaki and Nakadate. Typed on original negative envelope: World Friendship. Sinai Temple was located at 4th and New Hampshire in the Mid-Wilshire district just east of Hancock Park, later moving westward after acquiring and developing a new location at Wilshire and Beverly Glen in Westwood in 1956.